multimedia Hey thanks for checking out the deck, didn't think you would find it anytime soon haha. I definitely took your suggestions alongside everyone elses, I can see Fallen Ideal usefulness with flying and the ability varying but I like the idea of Spear of Heliod a bit more due to its 2nd ability and its the same cost but rather white mana. I understand ideal's point as in it comes back to your hand if it came from the battlefield which is an additional counter. I'll play around a bit with Ideal and Spear to see which works a bit better. 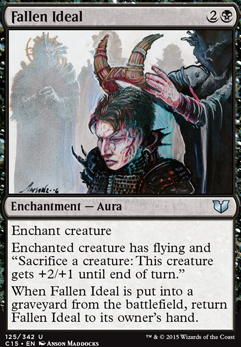 I guess I like the idea of +1/+1 for everything more than giving one flying with the sacrifice effect. But the useful one is returning it in hand to play it again. The help with two new lands and ridding of lands like the Guildgate also really helped out, I was stuck on finding a land to replace ones like that with and the ones suggested are a big help. Otherwise there really isn't anything else that could've been said better for suggestions. Thank you very much :). These new additions and cards to cut looks alot better now. Thanks and really appreciated. 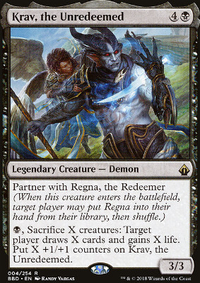 Several really good cards here, but I think you're going to have trouble getting enough experience counters fast enough for Spirits created by Daxos to matter. Daxos is a slow Commander, to increase the speed of getting exp. counters consider some low mana cost enchantments that can return themselves back to your hand to be cast again with either an ability or when they go to the graveyard. 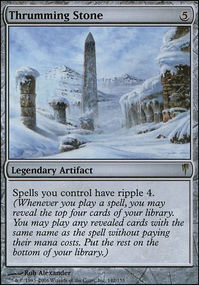 Smothering Tithe : amazing ramp for white in multiplayer Commander. Flickering Ward : protection for Daxos and bounce it back to your hand; one of the best ways to get exp. counters. 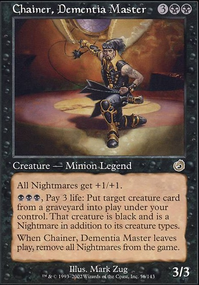 Gossamer Chains : bounce it for no mana cost to prevent a creature from doing damage to you. Like Ward it's only two mana to get repeatable exp. counters. Conviction : three mana for repeatable exp. counters. Open the Armory : search for Ward, Connections or any other aura. Heliod's Pilgrim : same as Armory. Eidolon of Rhetoric : when you have experience counters you don't have to play a lot of spells because you have a repeatable source of creatures from Daxos this makes cards that allow players to only play one spell a turn quite good. Sun Titan : repeatable reanimation of 3 or less CMC enchantments, combos with Renewal. His high mana cost is worth it. Most of these are high mana cost cards. I don't think you need all these anthem effects for tokens since the main source of tokens comes from Daxos and those tokens should already be big with high power/toughness. I love the aura/curse theme, I had one a few years back that was made for casual play. It was a really slow paced pure black deck relying on lasting 5 turns and playing a curse of misfortunes. I removed 3x Fallen Ideal and 2x Bitterheart Witch and 3x Faith's Fetters . To replace them I added 4x Ethereal Armor and 4x Cartouche of Solidarity . I like the witch, and ran a playset of it in my casual deck, but I kept running into mana issues and not being able to afford the witch. Plus you have the issue of having to kill it off. 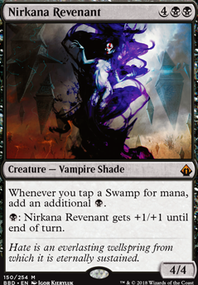 I would rather be more aggressive early game with the one mana enchantments, and still have curse of misfortunes to rely on for later game curse combos if it drags on that long. So first of all, I’d like to suggest a handful of death effects. Ogre Slumlord spits out nasty deathtouchers that can deter many non-lethal attacking forces, only first strikers would want to swing into them. 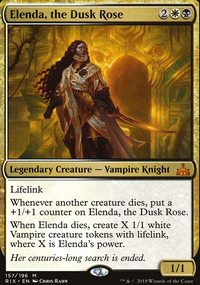 Blood Artist is a favorite of mine, hits all creatures that go to yards and is a constant life swing, it’s a card that is situationally better than Zulaport Cutthroat. 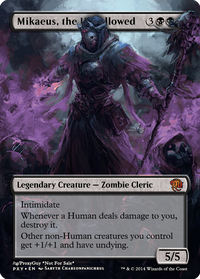 Razaketh, the Foulblooded offers a tutor for a sac and two life. In this deck that doubles to two tutors. A bit high cmc but being able to tutor in response to other players can win you the game in as little as one rotation. Fallen Ideal is an amazing win con to have in your back pocket. Throwing the enchantment on Teysa and sacrificing a mere 5 creatures is enough to swing in the air for lethal. As an added bonus, the enchanted creature can sac itself to dodge removal and return fallen ideal to your hand. Culling Dais is a card that I used in my Teysa deck, here it has twice the draw power. With a tap to sac you can use it in response to removal in order to gain card advantage. That’s all for now, you’ll hear from me again soon! First off, cool deck! Haven't seen a whole lot of eldrazi decks that are B/G for EDH. For suggestions, your CMC is very high so I'd add more ramp and at least 1 more land. As the above poster said, extricator is not legal for your deck so you can cut him. That gives you one slot to play around with. I realize you're on a budget so I won't suggest things like Mana Crypt or Ancient Tomb. Again however, I'd try my best to either add more ramp or more lands. Also I'd add in removal of some sort if possible. I'll list my suggestions. I won't suggest anything over $6.